Everywhere you turn in the Eastern Sierras there is a nook or cranny that you can drop your line and catch a story book big fish. 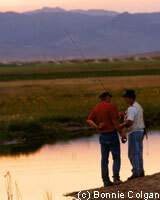 Mono County fishing season is from the last Saturday in April to November 15. The California fishing season is different so you can often start fishing early or stay later to extend your trips to Mammoth. If you like to sleep under the stars, you will want to pitch a tent at one of the many campgrounds in Mammoth. If you're more inclined to go for the cabin rentals in Mammoth you'll generally be staying in town, where boat parking is also easiest and the showers are hotter. If 5 star "glamping" is your style, talk to one of our concierges. They know best where granite isn't on a mountain, but rather on a counter top. If fresh water trout fishing in California is for you, you'll soon find out why Mammoth has no equal. A multitude of lakes, rivers and creeks are stocked with rainbows, brooks and German browns anxious to take the bait. Catch and release in some areas, such as Hot Creek in the scenic Long Valley. Catch and eat at most others and they are juicy and full of flavor. Sizzling on the grill with a little butter and it is one tasty treat. Mammoth fly fishing is prime along the San Joaquin River in the Red's Meadow/Devils Postpile area, at Storcher Lake or just outside town at popular Crowley Lake. Convict Lake is also a popular place to fish as it is a small lake, quiet with the most awesome mountains surrounding it. There are a few cabins at Convict Lake but they go fast, so you must reserve them well in advance of your dates. Looking to win a prize for your fish? Here is the current list of Mammoth fishing derbies. Experienced fishermen can find a quiet place to go put their pole in the water, or join in the fun and camaraderie of a weekend derby. Some of the best are sponsored by Convict Lake especially the season closer from October to November 15. Wonderful trout fishing can be found in our many lakes, rivers and streams, stocked with locally raised, world famous, trophy-size Alpers trout. You will find big fish, you know the kind that "get away" cause we grow them big here. The Mammoth fish stocking is usually on Thursday and 1000s of pounds of fish go into the lakes. It may be called cheating... but you can often find a fisherman chasing after the stocking trucks just to make sure he doesn't get skunked. For the non fishermen, or if you need a break you might want to visit the local Mammoth fish hatcheries. They have interesting presentations on how they spawn and grow our trout. Call the hatchery for tours and information. It really gives you a nice appreciation of the area, why fish and fishing are so important to the sustainability of Mono County tourism. Every fisherman will tell you they have a "secret spot" where the trout are running. It's no mystery however if you're from the area around here. The fisher people know every fishing hideaways in Mammoth. The Owen's River from Crowley Lake to Tinemaha Reservoir including the Pleasant Valley Reservoir and the Diaz Lake and Haiwee Reservoir are open to year-round fishing. There are some special restrictions; check with local ranger stations or the Department of Fish and Game for more information. The California Department of Fish and Game provides complete regulations. They also do some stocking. Fishing licenses are not available at Inyo National Forest Ranger Stations but can be purchased at many of the Mammoth sporting goods stores in the town. The Early Fishing Season opener is in March each year. This Early Fishing Season covers "all waters bounded by the Inyo County line on the south and west, Independence Creek on the north, and Highway 395 on the east." This early fishing season does not include the Cottonwood Creek drainage in any part west of Lone Pine. This area is open to fishing from March through October. There are several marinas where you can rent a boat, or a fishing tube. Boating and tube fishing are also a lot of fun and a nice variety from always standing on the shoreline or river's edge. Marinas in Mammoth are at Lake Mary, Rock Creek, Silver Lake, Gull Lake, June Lake, Grant Lake, Lake George, Convict Lake, Topaz Lake, Crowley Lake and Twin Lakes. If you want a different experience that is more like a local, you should think about hiring a guide for the day. One day with a guide and you will know the ropes. The registered Mammoth Fishing Guides really know the area and can make sure that you, or your group has a day to remember. The local fish and tackle stores have all the information and be able to recommend the spot where they hear the best fish stories, which likely means the best fishing each week. The Mammoth fishing report has all the latest news on the week's catch. 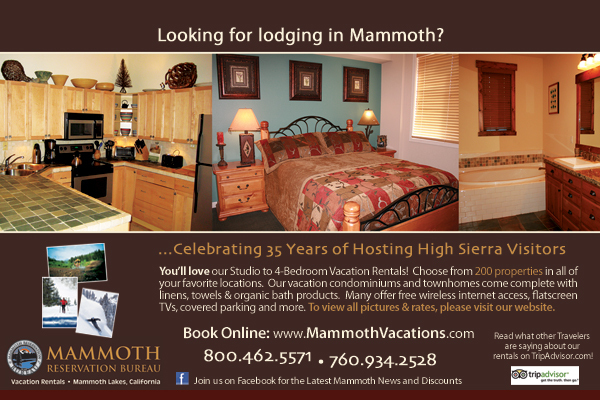 Have a great time out on the water fishing in Mammoth Lakes.